Why Hasn't Syria Used the S-300? The self-launching component of the S300 surface-to-air missile. Russian and Syrian media emphasized that Syrian air defense "repelled" the attack by Israel on Sunday. According to a spokesman for Russia's national defense management center, the Syrians used the Pantsir and Buk air defense systems. Israel struck at a Pantsir defense system in retaliation on Monday. But why wasn't the S-300, which Russia supplied to Syria in September, used by Damascus? The continuing quiet among the S-300 gunners is a perplexing mystery that underpins the shadowy and deadly conflict unfolding in Syria's skies. In late September, Russia announced it would give the Syrian regime the S-300 system in the wake of Syrian air defenses mistakenly shooting down a Russian Il-20. The Syrians had used an S-200 to hit the Russian plane, mistaking it for an Israeli warplane during an Israeli raid in Latakia. On October 2, Russia announced they had completed the delivery of the S-300. 49 units of "equipment, including radars, control vehicles and four launchers," were sent, according to Defense Minister Sergei Shoigu. New electronic warfare systems were also sent to Syria, including systems designed to control a "near zone" 50 km. from the system and a far zone "200 km." away that would guard against Israeli attacks, according to a report at Janes. Is this because the Syrians are not trained on the system? All three battalions of S-300 PMU-2 systems were active by early November, Syrian media indicated. "Russian technical specialists completed the reconfiguration of the system to replace the Russian codes and letter frequencies to the letter codes and radars of Syrian ones," a report noted. OBSERVERS OF Syria note that the issue is not that the S-300 is ineffective. 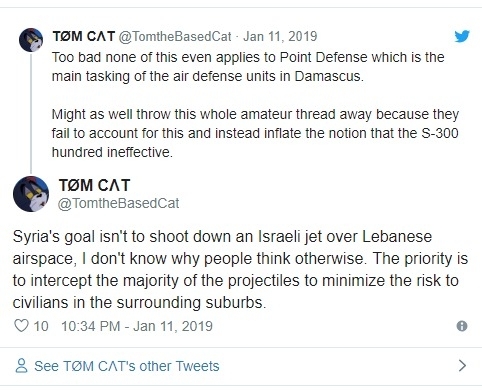 One expert who tweets under the name Tom Cat (@TomTheBasedCat) notes "the priority [of Syrian air defense] is to intercept the majority of the projectiles to minimize risk to civilians in the surrounding suburbs." In this analysis, Syria's goal isn't to use air defense to strike at Israeli jets. However, in the past Syrian air defense projectiles have strayed toward Israel. In March 2017 an S-200 reportedly was fired and intercepted over the Jordan valley by an Arrow missile. An F-16 returning from an air strike was pursued by an S-200 missile in February and crashed in northern Israel. A Syrian missile heading for Israel was targeted by Israeli air defense on December 26. With the S-300 now in Syria, the question is why it hasn't been used. Tom Cat argues that "the S-300 is for Theater Defense against air-breathing targets like ballistic missiles and enemy planes, not for Point Defense like tonight [January 11] and the previous times." In this analysis Syrian air defense doesn't use the S-300 because it's not the right system to stop the kind of threat involved. "The game will change when the S-300 is moved southwards because then they can actually track and target the jets," the expert tweeted on January 13. Others have speculated that the S-300 operators are not fully trained and that they will be ready by February of this year. This joins accusations online that the S-300 has not been effective or that it hasn't been used because of fears that if it doesn't work as planned then it will be an embarrassment for the Syrian regime and its Russian ally which has staked some of its pride on providing the system to help deter air strikes. Another important aspect of the S-300 discussion is the public relations value of having the system work and also deterring air strikes. AFTER THE December air strike, there was an apparent hiatus in such strikes. But then Israel took credit for the January 12 and January 20-21 air strikes. Former IDF chief of staff Gadi EIsenkot even said in an interview that "thousands of targets" had been hit and "in 2018 alone, the air force dropped a staggering 2,000 bombs" on Syria, according to The New York Times. This appears to raise serious concerns about Syrian air defense and its inability to deter the strikes, interdict them or use its more sophisticated new technology. Syrian state media repeats claims again and again that it has intercepted Israel's missiles. Russian media plays this up as well, with TASS claiming on January 20 that seven Israeli guided aircraft missiles were intercepted. The point here is to show that the Buk and Pantsir systems are doing their job, and the Pantsir S-1 is providing the point air defense it was designed for. 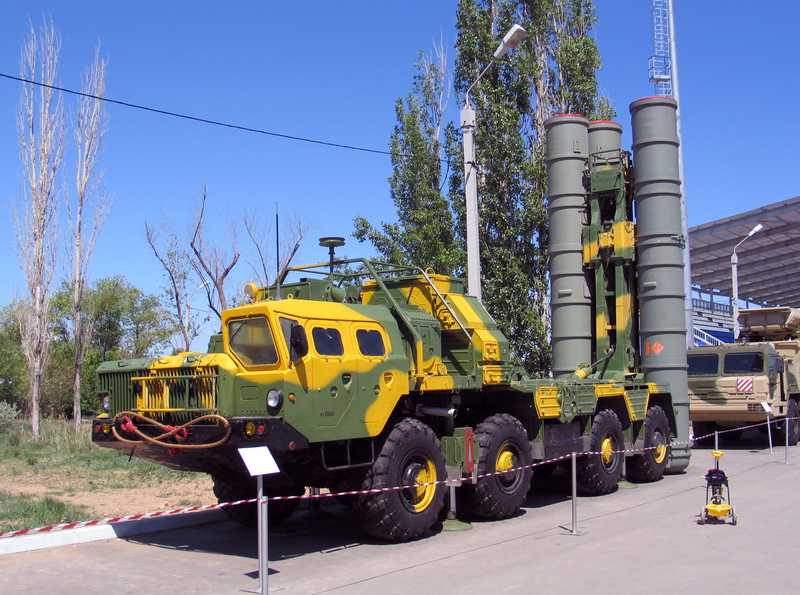 Nevertheless, the question mark about the S-300 remains. When it was deployed it was portrayed as a game changer. But Reuters had reported in 2015 and again in October 2018 that Israel had trained against the S-300 system in Greece. Regional countries are watching, as well as world powers, because the Syrian conflict is not just a conflict but a test of two different defense and combat systems, one in Israel that is linked to Israel's advanced technology and defense industry and the West, and one supplied by Russia. Echoes of the Cold War – when Western-supplied technology rolled into battle with Israeli forces against the Syrian army in 1967, 1973 and 1982 – overshadow what comes next.